What are black holes doing at the center of galaxies? "Black holes are regions of curved spacetime that differ drastically from the relatively nondistorted space we are used to. The distinctive feature of a black hole is that we can separate its geometry into two regions: the exterior where space is curved but objects and messages can still escape, and the interior, lying beyond the point of no return." "In fact, the interior is actually in the future compared to the exterior, so the traveler cannot escape, because he or she cannot travel to the past." Juan Maldacena, Scientific American, November, 2016; p 28. 300 million light years away there are two very large – ten billion times the mass of the sun– black holes; the largest ever discovered. By comparison, 25,000 light years away is the black hole at the center of our parent, Milky Way Galaxy. 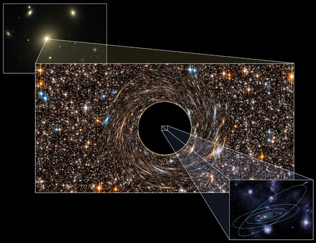 "Astronomers at the University of California, Berkeley, recently discovered two massive black holes more than 300 million light-years away and 10 billion times the size of the sun." NPR Host Scott Simon talks with Professor Chung-Pei Ma, who led the team that published the study. "The term black hole is of very recent origin. It was coined in 1969 by the American scientist John Wheeler as a graphic description of an idea that goes back at least two hundred years, to a time when when there were two theories about light: one, which Newton favored, was that it was composed of particles, the other was that it was made of waves. We now know that really both theories are correct." "By the wave-particle duality of quantum mechanics, light can be regarded as both a wave and a particle. Under the theory that light is made up of waves, it was not clear how it (light) would responds to gravity.. But if light is composed of particles, one might expect them to be affected by gravity in the same way that cannonballs. rockets, and planes are. ...but the discovery of Roemer that light travels at a finite speed (300,000,000 meters per second \ 186,000 miles per second) meant that gravity might have an important effect." "On this assumption, a Cambridge don, John Michell, wrote a paper in 1783 in the Philosophical Transactions of the Royal Society of London in which he pointed out that a star that was sufficiently massive and compact would have such a strong gravitational field that light could not escape: any light emitted from the surface of the star would be dragged back by the star's gravitational attraction before it got very far....Such objects are what we now call black holes, because that is what they are: black voids in space." "A consistent theory of how gravity affects light did not come along until Einstein proposed general relativity in 1915. And even then it was a long time before the implications of the theory for massive stars was understood." "The life cycle of a star." A star is formed ...(mostly hydrogen) starts to collapse.... as it contracts the atoms of gas collide with each other more and more frequently and at greater and greater speeds–the gas heats up. Eventually, the gas will be so hot that when the hydrogen atoms collide they no longer bounce off each other, but instead coalesce to form helium." "Eventually the star will run out of its hydrogen and other nuclear fuels. Paradoxically, the more fuel a star starts out with the sooner it runs out. ....The hotter it is, the faster it will use up its fuel....When a star runs out of fuel, it starts to cool off and so to contract. What might happen to it was first understood only at the end of the 1920s." Stephen Hawking, A Brief History of Time. pp 81-83. "According to the theory of relativity, nothing can travel faster than the speed of light. Thus if light cannot escape, neither can anything else; everything is dragged back by the gravitational field. So one has a set of events, a region of space-time, from which it is not possible to escape to reach a distant observer. This region is now what we call a black hole. Its boundary is called an event horizon and it coincides with the path of light rays that just fail to escape from the black hole." "remember that in the theory of relativity there is no absolute time." 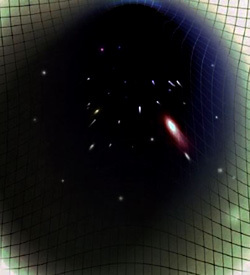 "Black holes are one of only a fairly small number of cases in the history of science in which a theory was developed in great detail as a mathematical model before there was evidence from observations that it was correct." Maarten Schmidt, in 1963 an astronomer at Mount Palomar was the first person to "discover" evidence for such an object. "A further look at black holes points the way to . . . . how might our two very different, bizarre phenomena – wormholes and entanglement– be related. . . . In 1974 Stephen Hawking showed that quantum effects will cause black holes to emit radiation in the same way that a hot object does–proving that the traditional wisdom that nothing can escape a black hole is too simplistic." Juan Maldacena, Black holes . . . etc., Scientific American, 11/2016, p 31. "They are Monstrous" Chung-Pie Ma, UC Berkeley Astrophysicist. Juan Maldacena, "Black holes, Wormholes and the Secrets of Spacetime." Scientific American, November 2016, pp. 28-31.
by THE ASSOCIATED PRESS, December 5, 2011. Handout photo released Tuesday by Nature shows a figure depicting the immense size of the black hole discovered in the galaxy NGC 3842. Stephen Hawking, A Brief History of Time: From the Big Bang to Black Holes. New York: Bantam Book, 1988.